Lea is a stylist who has been a part of the TRIO EVANSTON team for 7 years. Her major influence is the Vidal Sassoon Philosophy, of which she has 10 years of experience. Lea is one of the educators for TRIO’s advanced training program, and she loves teaching and mentoring future stylists. 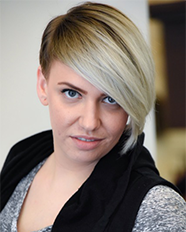 Lea has a passion for men’s barbering, utilizing her keen eye and precision cutting skills. From classic shapes to creative looks and trends, Lea can bring your vision to life.